The meme was posted on Friday night and removed hours later after over 10,000 shares. West was spotted at Trump Tower for political meetings today. 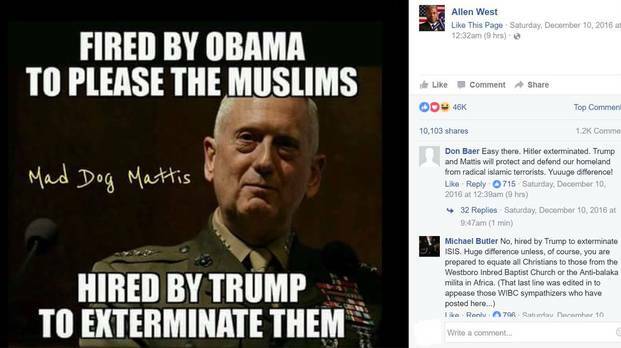 A reprehensible political meme was posted to the Facebook page of former Republican congressman and Tea Party leader Allen West on Friday night (Dec. 9). West, who represented Florida's 22nd congressional district in the House of Representatives from 2011 to 2013, is a prominent conservative political commentator with over 2.5 million Facebook followers. This particular meme -- which effectively called for the extermination of Muslims -- was shared over 10,000 times and received almost 50,000 likes in the hours that it was up on West's page. The meme shows an image of James "Mad Dog" Mattis, who was recently selected by Donald Trump to be the Secretary of Defense upon his inauguration. Mattis had been appointed by President Obama as commander of the United States Central Command in 2010, but upon conflict with the President over military strategy in Iran, he left the post in 2013. The meme reads: "Fired by Obama to please the Muslims / Hired by Trump to exterminate them." On Saturday, Michele Hickford, the editor-in-chief of West's website, released a statement on West's Facebook page apologizing for the bigoted meme. She originally wrote, "Last night I posted a meme without Col. West's knowledge or consent which was inappropriate and crossed the line," reports New York Daily News. Though Hickford's apology has since been amended, now stating that she had nothing to do with the meme, writing, "I was not the one who posted it, and it was posted without my knowledge." In both the initial and newly edited apology, she absolves West of any responsibility. "Its message was despicable, offensive to many, and a terrible error in judgement by the person who posted it," reads the latest version of Hickford's Facebook statement. It so happens that West visited Trump Tower today to potentially meet with the president-elect. When asked if he was meeting with Trump to discuss security issues, West responded, "We'll see when I get up there." VOTE: What Is J. Cole's Best Project?